Heyya ! While I was just scrolling slackly on my Facebook's news feed I found that fellow bloggers were sharing posts and articles that Android has some 81% share in the world smartphones and iOS was in dust. That was the moment I realized how big Android was. 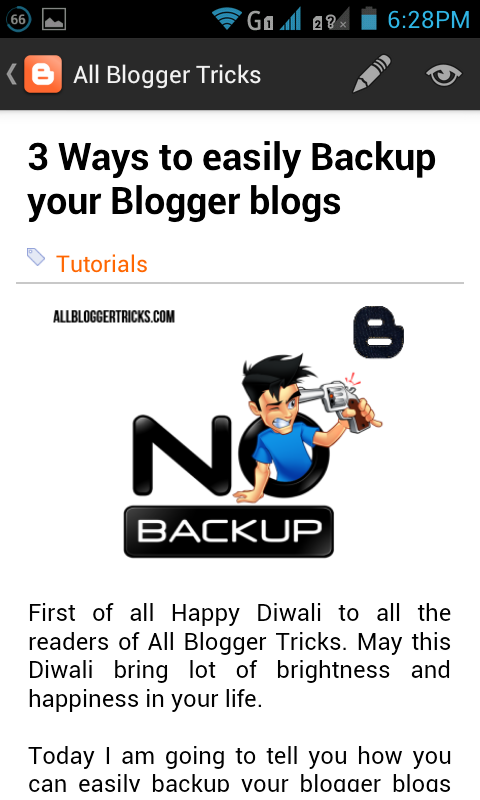 Subsequently it came into my mind that there is an official app for blogger too but I have never used it. So I decided to review this app so that fellow bloggers can know about it and maybe it will help them one day. 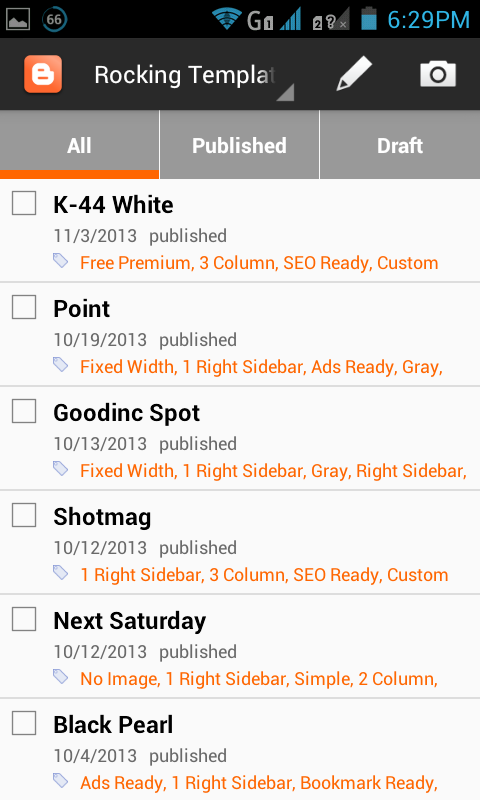 The app I reviewed is v2.1.1 and was updated on November 10, 2013. The app is available at the Play Store free of cost. You can download it by clicking on the below link. The first impression for the app for me was quite well. It was smooth and interactive. Looked clean, simple and extremely clear to what where is. Moving on I found that it was simply a app to edit, create and work out with just posts. There was no Stats, Page Editor or Blog Settings option. Summing up the things I found the first impression of the app quite well but was dissatisfied as there was no introduction of some of the important elements of the blog in the app. After briefly going through the apps I acquired a bunch of Pros and Cons of this app which I am going to list below. Lets have a quick look at the positive aspects of the Blogger Official App. The app is basically designed for travel bloggers. Functions such as Geo Tagging, Picture uploading helps a travel blogger easily update his blog without using PC, Macs or Laptops. If you want to shoot a quick blog post then this app is for you. For news blog this app can be used beneficially. Just like travel bloggers this app also helps photo bloggers largely with its feature to add, view, edit pictures easily. The app is designed well, its interactive and clean. Its smooth to use and uses each part of the screen very well. Everything is organized is a good manner. Its syncs all the posts you make within a fraction of seconds. This can be helpful if a blog has more than one author. Every coin has 2 sides so its here. 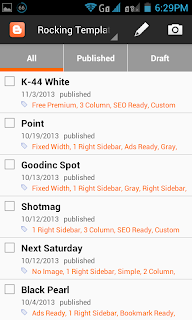 No doubt the blogger app helps us in various way but it too has some faulties which are listed below. There is no option for important things of the blog such as Stats, Blog Settings, Template Editor, Dashboard etc. The app can not be used by all the professional bloggers and is limited to people who have personal blogs. People have reported many errors about this app. I too faced Not Responding Popup while uploading picture from camera but it was just for a few seconds. More importantly the app is primarily made and optimized for Tablets and a little work has been done for smartphones. The final words from me would be that the Blogger App is really good but it still needs a lot of work. 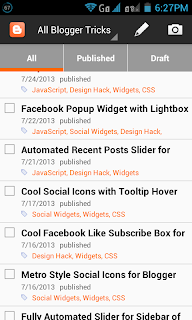 With the increasing number of blogger users the blogger team should pay more attention to its apps too. 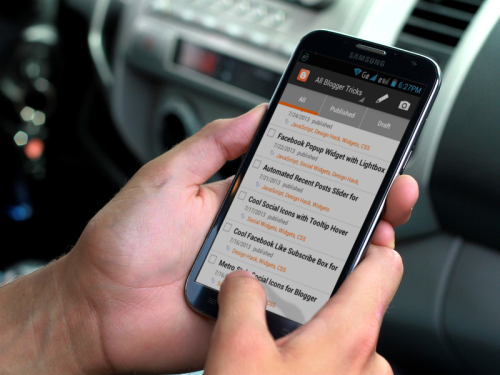 The blogger app should surely be in the smartphones of Travel and Photo bloggers. 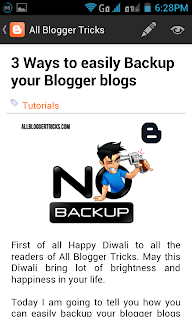 It can be used by normal bloggers too but would not be able to do all their desired tasks. The app has a lot of potential but requires little work. 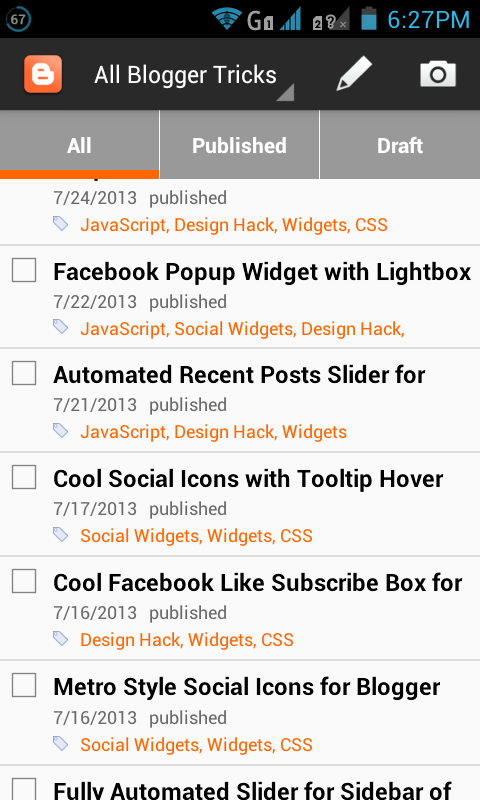 Since blogger is a huge platform many other app developers have too made apps for Blogger you can check them below. Greate work. Hi everyone. I see a template here. It is so cool. hic..But i have not enough money. Everyone can sell it for me with 15$? http://themeforest.net/item/nami-press/6166852, :(. Thanks. Apps are the best way to keep your customers engaged with your product - they act like gentle reminders to pull them back to your product or service.